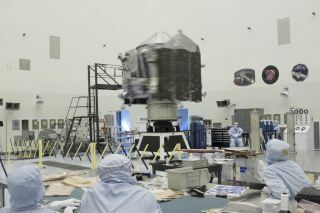 Engineers perform a spin test of the Mars Atmosphere and Volatile Evolution, or MAVEN, spacecraft NASA's Kennedy Space Center in Florida on Oct. 21, 2013. The probe is slated to launch toward Mars on Nov. 18, 2013. NASA is putting the finishing touches on its next Mars mission, which is slated to launch toward the Red Planet just three weeks from today (Oct. 28). The Mars Atmosphere and Volatile Evolution spacecraft, or Maven for short, is due to lift off from Florida's Cape Canaveral Air Force Station on Nov. 18. Maven is designed to study the Red Planet's upper atmosphere in great detail, and mission scientists hope the probe's observations yield insights into how Mars shifted from a relatively warm, wet world in the ancient past to the cold and dry place we know today. Maven's journey will begin atop a United Launch Alliance Atlas 5 rocket. The probe will then endure a 10-month cruise to Mars, arriving in orbit around the Red Planet in September 2014. The $671 million Maven mission will spend at least one Earth year studying Mars' air with three different instrument suites. Scientists hope Maven's observations reveal details about how the Red Planet lost much of its atmosphere, which was once relatively thick but is now just 1 percent as dense as that of Earth. "We just had to leave that one off to stay focused and to stay within the available resources," Maven principal investigator Bruce Jakosky, of the University of Colorado, Boulder's Laboratory for Atmospheric and Space Physics, told reporters today. Maven's march toward launch was briefly threatened by the government shutdown, which forced NASA to cease most operations and furlough 97 percent of its workforce from Oct. 1 through Oct. 16. But the mission received an emergency exception on Oct. 3, in large part because of Maven's importance as a future communications link between Earth and robots on the Red Planet's surface. The two-day halt in liftoff preparations has not had any major effects, mission officials said. "We're on a nominal pre-shutdown plan at this time," said Maven project manager David Mitchell, of NASA's Goddard Space Flight Center in Greenbelt, Md. Maven's launch window officially runs from Nov. 18 through Dec. 7, though Jakosky has said that that spacecraft could actually lift off as late as Dec. 15. Beyond that date, the mission would have to wait more than two years for another favorable alignment of Earth and Mars.